Click here to view the alternative ‘booklet’ or ‘turning page’ version of this page. Edgar Roberts Mobbs, born 29th June 1882 was a charismatic resident of Dartmouth House, Olney, Buckinghamshire. The house was the family home of Edgar’s parents during the early 1900s. Edgar, a gifted rugby union footballer, played for and captained Northampton RFC (the Saints) and later, the England team in 1910. Subsequently Edgar was equally renowned for his outstanding military career in the Northamptonshire Regiment during the First World War. He was killed in action in 1917 whilst leading a charge at Passchendaele. As an acknowledged hero of the First World War; a monument to his memory was erected in Northampton, a testimonial to his heroic exploits. Edgar was born in Northampton but spent most of his early years in Olney. He began to show his aptitude for sport very early. When eight and a half years old, and a scholar at the Bedford Modern School he played rugby for a school team of under tens, and later obtained his place in the house team. A knee injury at sixteen prevented him playing rugby for five years, but he did play hockey and cricket for Olney. The photograph of the Mobbs family below shows Oliver and Elizabeth Mobbs in the garden of their home at Olney, with their four sons and two daughters. 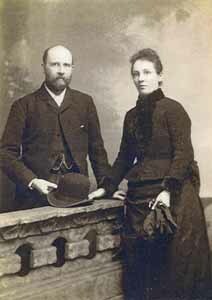 Graily is sitting on his mother’s knee and holding his father’s hand. 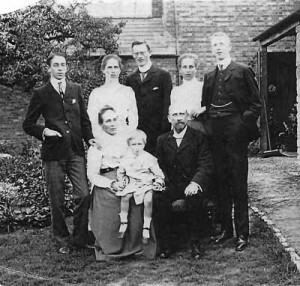 Behind them are Herbert, on the left, his hand resting on his mother’s shoulder, with Elsie beside him standing behind her mother. In the centre is the eldest son Noel, with Elsie’s twin Olive next to him on the other side. Edgar is on the right, wearing a watch chain, with Olive’s arm linked through his. At six feet one inch he was the tallest in the family, with fair hair and blue eyes. It was not until 1903, whilst still residing at Olney, that Edgar again took up the game of rugby. After restarting his rugby career he soon came to the notice of the Northampton St James’ (Saints) Club to which he transferred in 1905. 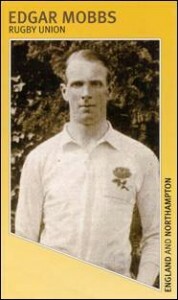 Edgar became captain of Northampton Rugby Football Club in 1907, a post he held for six years during which time he scored 177 tries for the club. In 1909 he was selected by England to face the Australians. In this match he scored a try, the first ever for England against Australia but the game was lost by three points to nine. 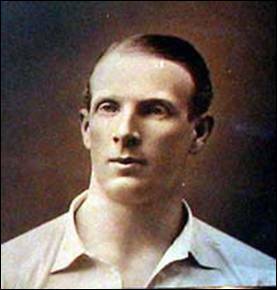 Edgar gained seven England caps in all and captained his final international match in 1910, against France. England won this away match by three points to eleven. Edgar continued to play first class rugby for Northampton, East Midlands and the Barbarians until 1913, when at the age of thirty one he decided to retire. Edgar also played rugby for Toulouse, where he became a great favourite. It is said that his large physique, pace, strength and tremendous ‘hand-off’ made him one of the most dangerous attacking three-quarters of his time. He also played cricket for Buckinghamshire. The outbreak of war in 1914 found him as manager of the Pytchley Auto Car Company at Market Harborough, having followed his father into the motor industry. He was then contemplating emigration to Canada. When he attempted to enlist in August of that year Mobbs was initially refused a commission as, at thirty three, he was over the mandated age limit. Not a man to allow a trifling matter like this to get in his way, he joined up as a private soldier and raised his own unit of 264 men as ‘D’ Company, 7th Battalion, Northamptonshire Regiment. ‘D’ Company included many Rugby players, including E R Butcher, captain of Devon, and H Willett, captain of Bedford. Mobbs arrived in France in September 1915, and took part in the Battle of Loos. In March 1916 he was promoted to Major and in April 1916 took over command of the 7th Northants, later being promoted to Lieutenant Colonel. He was wounded by shrapnel in August 1916 while taking part in an attack on Guillemont during the Battle of the Somme. 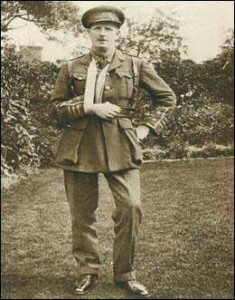 After two Mentions in Despatches in 1916, Mobbs was awarded a DSO in December 1916 for his work as a Battalion Commander. The 7th Northants suffered severe casualties during the Battle of Arras in April 1917. He was wounded at Messines on 7 June 1917, but returned to the Battalion on 26 June. On 29 July 1917 while in his headquarters in Canada Street tunnels near Zillebeke, Edgar, hearing of the loss of officers from the walking wounded, decided to lead the Battalion from the front. He moved to Shrewsbury Forest and was killed in action on 31st July at Lower Star Post while attempting to bomb a machine gun that had trapped a detachment of his Battalion. The Battalion history says ‘The fact that his body could not be recovered and buried, as all ranks would have wished, was perhaps a good thing, as it helped keep alive his memory in the Battalion, and inspired in everyone the resolve to avenge his death and to end the war that had already caused so much misery and suffering’. It is reported that of the 400 or more volunteers that served in ‘Mobbs Own’ Company, only 85 survived the War. On 10th February 1921 the first Edgar Mobbs Memorial Match was played at Franklins Gardens, Northampton between two of the great rugby loves in his life, East Midlands and the Barbarians. This memorial match was an annual fixture at Northampton, but in 2007 was transferred to Goldington Road, Bedford. In 2012 it was agreed that the match will now be played alternate years at Northampton and Bedford and for the 2013/14 season it will be played at Northampton. 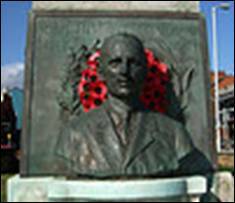 In July 1921 a bust of Edgar Mobbs was unveiled to his memory at the north end of Northampton’s Market Square. The monument, by Alfred Turner, carries reliefs of ‘Sport’ and ‘War’ and is surmounted by a heroic female figure. The inscription reads ‘In memory of Edgar R Mobbs DSO, erected by subscriptions of admirers the world over, to the memory of a great and gallant soldier sportsman. When the Great War broke out he founded ‘Mobbs Company’, joined as a private and rose to command a battalion to which it belonged. He did his duty even unto death’. In the 1930s the monument was moved to be near the town war memorial in Abington Square. The bust is wreathed after the Mobbs Memorial Match. 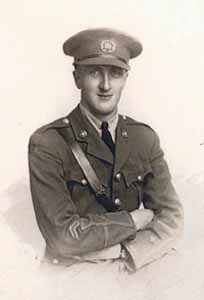 As a testament to Edgar Mobbs’ extraordinary personality and charisma, the following has been extracted from the website: 1914-1918.invasionzone.com. The extract demonstrates how Edgar Mobbs inspired his fellow sportsmen to follow his call to arms. Edgar subsequently paid the ultimate price; George Henry Percival was one of the fortunate survivors.As a testament to Edgar Mobbs’ extraordinary personality and charisma, the following has been extracted from the website: 1914-1918.invasionzone.com. The extract demonstrates how Edgar Mobbs inspired his fellow sportsmen to follow his call to arms. Edgar subsequently paid the ultimate price; George Henry Percival was one of the fortunate survivors. “My Grandfather, George Henry Percival, played for the Northampton Saints as scrum-half, in the period 1900-1914. By the time the war broke out he was in the second-team and only played occasionally under Edgar Mobbs, but when he called the meeting asking all sportsmen to join up alongside him, my grandfather followed the call. Unfortunately, as are most scrum-halfs (scrum-halves? ), he was pretty short, and when he got to the front of the queue, the Sergeant thanked him politely, but pointed out he was too short. My grandfather remonstrated with him, saying “My Captain said to come and join up, so here I am.” The Sergeant got more terse, and in the end had to threaten to kick him out the door. George turned on the Sergeant and said “With ***** like you running this war, you’ll soon kill off all the tall men, and then you’ll have to come for me, ‘cos I won’t come willing.” Two years later they had killed off the tall men, lowered the height restrictions, and sent George his call-up papers, which he ignored. Eventually two redcaps came to the house in Hood Street, only to find him with his case packed, put his jacket on, and said “I told you ******* in 1914 you’d have to come and fetch me, and now you have. Let’s go to War”. The following two additional photographs of Edgars parents and of his youngest brother Graily have also been kindly provided by Edna Jarvis. The Society is indebted to Phil Mobbs, a great-grand-nephew of Edgar Mobbs; also to Edna Jarvis and Stewart and Shirley Elsmore (the current owners of Dartmouth House) who have provided material and consented to the publication of this article. We also wish to thank the contributors to some of the referenced websites, with whom unfortunately we have been unable to establish contact.